Recently I came across a requirement to create a unique column which should allow multiple nulls and apply uniqueness on anything other than null. 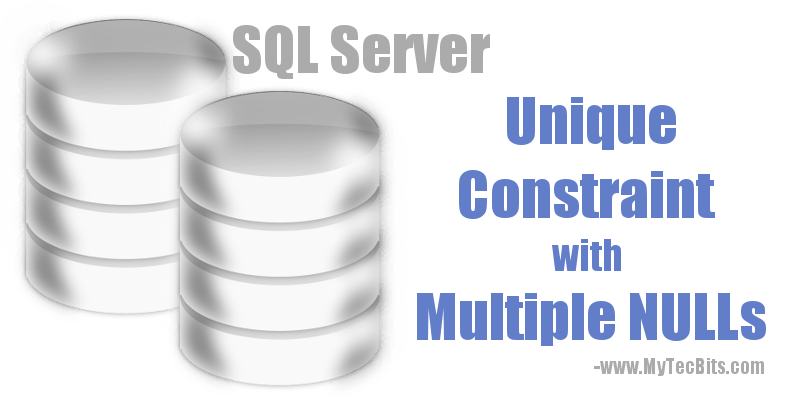 Starting from SQL Server version 2008 we can use the filtered unique index to create a unique constraint that allow multiple nulls. Here is the syntax and an example for creating a unique constraint that allows multiple nulls. In this example, I’ve created a table and a unique constraint with a NOT NULL filter. This filter condition will make sure the unique constraint ignores all the NULLs and apply uniqueness to the values other than NULL. Then I’m inserting several records with nulls in the unique column. You will notice, that you can insert more than one null value in the unique constraint column. However, it you try to insert another duplicate value, you will get the “Cannot insert duplicate key…” error. As you have seen in the above example, you can insert any number of NULL to the unique column. Now, try to insert a duplicate value. You will get the error as seen below. Cannot insert duplicate key row in object 'dbo.MTB_Table_C' with unique index 'IX_EmpCode_NotNull'. The duplicate key value is (A00A05). See more SQL Server Tips. About filtered index ad Microsoft Docs. This is nice. You should note that this will not work on existing tables with data. Thank you. Regarding the creation of filtered index on existing table with data: You will not be able to create the filtered index only if the column has duplicate values. In such case you will get error as below. If there is no duplicate other than nulls, then you can create this index. The CREATE UNIQUE INDEX statement terminated because a duplicate key was found for the object name ‘dbo.MTB_Table_C’ and the index name ‘IX_EmpCode_NotNull’. The duplicate key value is (A00A05).